Here’s a quick little interview with Gabe and Ben Luna, identical twin shredders from Corbett who have about twelve and a half feet of height between them. Do you guys know why I call you Ronnie and Donnie? G: Who’s Ronnie and Donnie? B: I never heard you call me that before. Oh maybe I just call you that behind your back. Have you seen the movie Rushmore? Alright which ones Ben and which ones Gabe? That’s not really going to help because people can’t see you in an interview. Who skates regular and who skates goofy? G: Gabe’s regular and Ben’s goofy. On a scale of 1 to 10, how much do you guys dislike each other? G: Uhhh, depends. Certain times it can be like ten. G: Most of the time. B: I think it levels out about 7, 7.5. 10 being…. B: it can get down to 5. So it can get down to where you like each other half the time and dislike each other the other half. B: On a good day. Is that an issue of being so close as twins that every annoying thing about each other is doubled? G: I don’t think it has to do with being a twin though because my sister is really annoying too. Your guys’ last name is Luna. What kind of name is that or what is your background? B: …Mexican. The whole side of my dad’s family is Mexican. B: …adopted. She thinks she’s Swedish or something. G: Swedish. She doesn’t really know. B: Well she’s never really bothered to look into it or anything. G: She just grew up in Portland. How long have you guys been skateboarding? G: Since we were in the end of fifth grade so..
G: so we’re starting our senior year now. Is it true that the first thing you did when you got your first board was go directly to the Corbett 4? G: No. 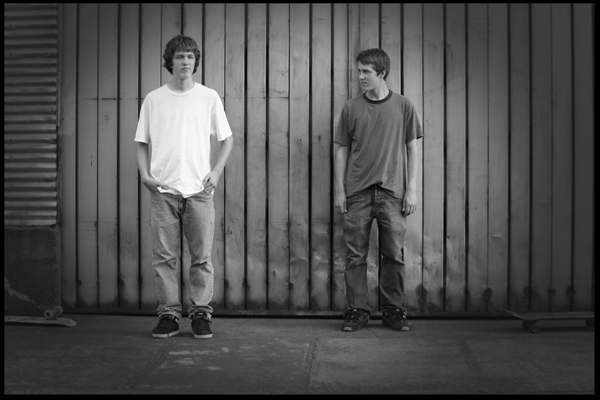 We skated in our garage for 2 years doing flatground tricks. B: We had to share our first board. Our first board was a Zero that the griptape was so worn down that it didn’t even grip anymore so we shared that for a few months. So twins sharing A board? Gabe? Wait, no Ben, Back Smith. B: I guess we’re just better at different things. Do you guys agree one’s better than the other? Gabe’s better than Ben? G: Well I know he’s better at some stuff. And I know I’m better at some stuff. G: Not really. We used to. G: We used to argue about it and stuff. Not anymore. On average, how much physical violence do you inflict on each other in a given week? Does it come to blows at least once every single week? G: No. We’ve actually hardly ever even actually punched each other… in the face. But other parts of the body are a total go. Why does Ben always have to take the laptop? G: I don’t know, he’s greedy. G: You always take it to work with you. B: No, I just carry it around in my backpack. He doesn’t want to carry it around in his backpack so…. G: It’s true. He always has to have the laptop. It’s true. B: I always end up carrying it in my backpack so if it’s my backpack I should take it. What about if Gabe DOES want to take it but he’s still unable to because you want to take it? B: If he carries it in his backpack that’s fine. B: It’s actually pretty much whoever calls the laptop gets it. So basically, the rule in your house is calling it applies to everything? You can do a call it on anything? 2 years ago you came to skatecamp as campers and had P Rod on the ropes in the game of skate. Is that story legendary in Corbett now? Has it become a part of the historical folklore? B: No, nobody really skates in Corbett. G: I don’t really like it. B: There’s only one other person that skates in Corbett and they don’t even barely skate anymore. For the record, who actually had P Rod on the ropes? 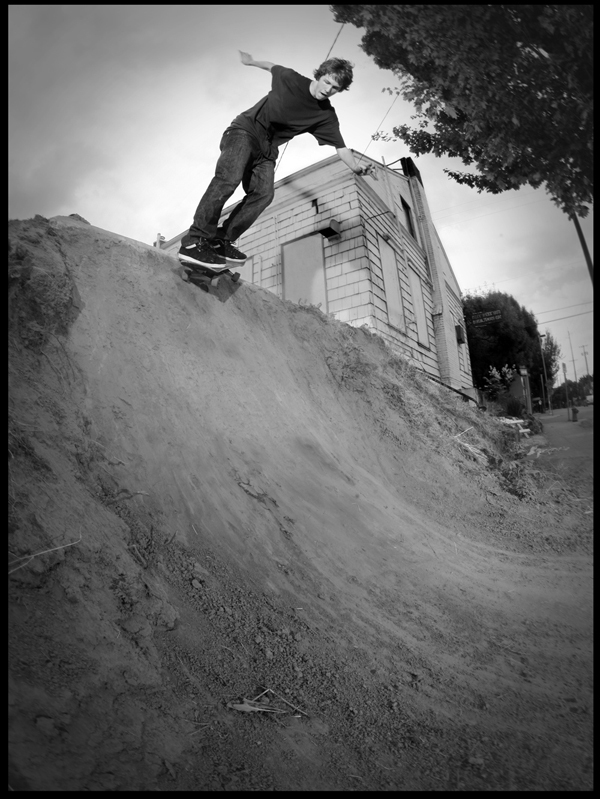 G: I almost got him on a switch varial heel. B: It was still a shutout though. He still shut everyone out. How do two 6’4” identical half-mexican kids hook up with a Krazy Bone looking Nick Cannon from Hillsboro, literally 60 miles away? G: I think he’s talking about Compton. B: His name’s Chris Nichols. No, Nick Cannon. Do you even know who Nick Cannon is? B: So you’re talking about Compton? Yeah. See, that whole question was just to make fun of Compton. It’s much funnier if you actually know who Nick Cannon is. G: I think he challenged us to a game of skate once. Do you guys ever think about geographically, how far you live from Compton? It’s got to be like 60 miles. G: I never really thought about it. Yeah, that’s one of the sick things about a skatepark. B: Yeah we probably never would have met him. You endured 2 weeks of Little Johnny living at your house. He would not go home. How close did he come to getting a swirly? G: It makes it worse. B: He won’t listen. He’ll just say “No, are you going to make me?” He won’t listen. G: For a couple days we weren’t talking. He got angry at me so we weren’t talking. How old is that kid? 12? It blows me away a kid that young can have that much attitude and play mind games with guys who are 17 or 18. B: Yeah, he can be irritating. The story is that you guys got jobs strictly for the food discounts. Is that true? G: No we got jobs because my mom forced us to. She quit giving us allowance. G: We used to get allowance. $30 a week. B: Yeah. Up until like last December. How many calories a day would you consume if you could make a whopper last more than 3 bites? G: Uhhh, wait, I don’t get it. B: How many calories are in a whopper? G: Well, I don’t really like the Whoppers I go for the BBQ Bacon Tender Crisps. B: or just the regular cheese burgers. If you could, would you eat more than you actually do? The problem is you just keep running out of food. B: I guess it’s more of a money issue. G:Yeah, if I had the money I would. If I had the money I’d eat a lot more than I do now. B: Maybe. I get full sometimes. How many times have you considered sending in one sponsor me tape, but as one guy who’s pretty proficient both switch and regular? B: That wouldn’t really work actually because he usually skates nollie and switch. G: I can’t skate regular. So it’s never crossed your mind? So basically you just dissed Gabe? G: I know. It’s kind of true. G: It was fun. I did really bad in the contest. G: I don’t know. I didn’t … I don’t really like skating other skateparks, especially ones that are that crowded and that skatepark was more crowded than anywhere I’ve ever skated. So I didn’t warm up much. All I ended up doing was nollie flipping the stairs. Wait. You went to Texas and only nollie flipped some stairs once and that’s it? Weren’t you skating the whole day? G: No, I did it once in practice. And then I did it in my run and then almost switch bigspin heelflipped the hip and that was it. Were dudes there better than you were expecting? G:Yeah, everyone was better than I was expecting. Everyone was better than what I expected from watching the videos and stuff like that. You like Cody McIntire? Is he good? You like that dude? G: Yeah he’s really good. I don’t know if I’d say I like him but he’s really good. You know that’s his home park though? It’s kind of like the unfair advantage you guys had by having the qualifier here. You guys already have the park wired. Any thing else you guys want to say? Quit calling me Ben? Quit calling me Gabe? Does that get annoying? G: I answer to both actually. B: It’s kind of annoying sometimes. If someone says one of our names, I usually just look to see who their trying to talk to. If they’re trying to talk to me or not. B: It happens all the time at our work now, since now we both work at Spaghetti Factory. Well he works at Burger King and Spaghetti factory. G: Yeah, I have 2 jobs. B: And I quit Carl’s Jr. and I’m just working at Spaghetti Factory now. So does that mean Gabe’s more of an overachiever? B: Not really. I don’t want to work 2 jobs. There’s no point. G: Well that’s part of it, but, it’s also… it’s…I don’t know. So you’ll keep a job based on how much you like the food there? G: Yeeeaaahh…..but yeah. Spaghetti Factory is harder. I like working at Burger King because it’s easy.